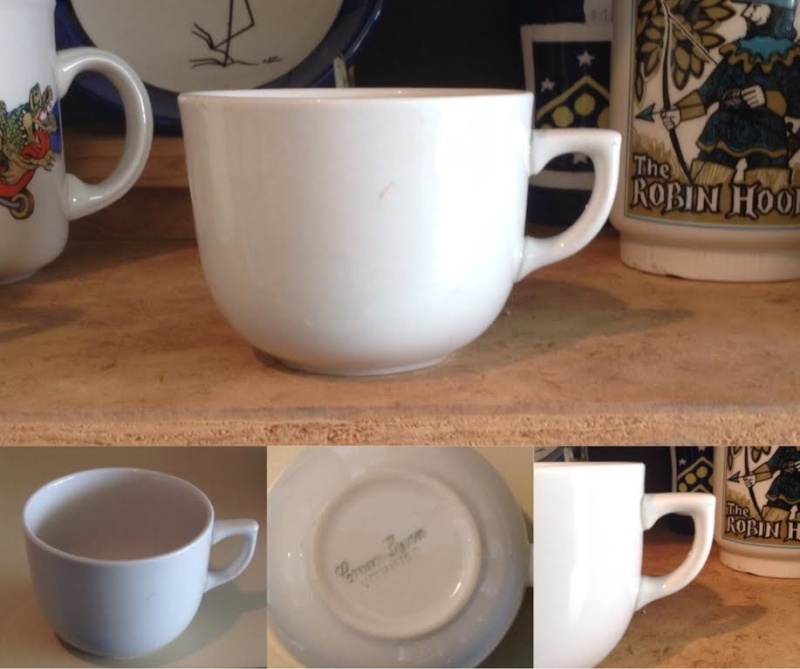 Earliest marks on Crown Lynn cups, saucers, and mugs. I don't like buying things that are chipped or otherwise damaged but in this case it was the cheapest of two damaged saucers, but more importantly an early example of the 739 saucer. The two are the only 739s I remember seeing with 1948-55 marks. I have made a point, where possible of buying the earliest example available of each cup, saucer, or mug shape that I collect. I often buy more than one so I can see what changes have occurred to shapes over the years. Also the earlier marks confirm for me that the shapes were actually in production from earliest times. The cursive marks were the earliest used by Crown Lynn while trading under that name (sometimes appearing also with the Ambrico "Made in NZ" as on the Seppelts bottles). There are many different early Crown Lynn marks, include those with and without square or scrolled boxes, those marked also "New Zealand", and those marked also as vitrified. From the pieces I have looked at (especially the Seppelts bottles) I have formed the impression (whether correctly or not) that the boxed marks preceded the plain crown Lynn marks, in which case the saucer I did not buy would have been earlier. What cup went with this saucer? In considering what cup would have been used with a 739 saucer from 1948 to 1955 I have encountered some issues. It would need to be a relatively small vitrified cup. Firstly, the obvious 863 was a vitrified variant of the 781 tulip which shape was not developed until the early 1960s. Nix to that. Second thought is the 755 vitrified Carlton cup but I have some doubts there as I have yet to see a vitrified 755 with a 48-55 backstamp. If someone else has one it would be useful for me to see a picture. I am as yet unconvinced that the vitrified Carlton cup existed at the time. I have an earthenware cup in the 755 shape that I think was the original 755 but that (too) is dated as 1955+. Third is good, but rare. We have seen only the one example so far, an odd cup in Jim's collection that has the Carlton cup body but a different handle. The first known match for the vit 755 cup was indeed the 739 saucer so we know the body fit is good. Did this carlton cup with a different handle get a shape number? I mentioned it to you when you were looking at attributing the leftover numbers. It may be the spare number, or a number that has been reused for something else, or it may be an earlier form of the Calton cup as they share a body shape. I need to check the Whangarei Hospital Carlton cup to see if that had a 48-55. No pics of base but I noted that it had crown and star 55-64. I think this means that I have yet to see a Carlton with a 48-55. I have an earthenware (vs vit) Carlton cup and have wndered whether that is the one in the ver old picture of old cup shapes. Then again that has a British backstamp so will be ca1960. I guess it could be another shape looking for a number but I'm inclined to think that, like the e/w and vit demis, they originally had the same number, coming from the same mould. 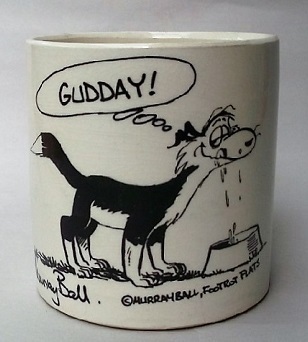 Do you think we should put it in the gallery with the "Father cup" so that we don't forget about it.? I guess both "carlton cup vit with pointy handle" and "crarlton cup earthenware" should bot be there.